There are plenty of things we haven't tried yet. For example, how about a water transfusion? I still like the lightem and trashem dino trap idea. I guess I should post more, I tend not to put up the stuff that didn't work.. I've tried all those with no success against O. ovata. Well, not the UV, but I did run dark except for my 'sump' lit 24/7 with trap material. After 5 days or so the floss wasn't catching much. Dinos returned within 2 days, and now do not seem to respond to lights out at all. Also was given about 5kg extremely live rock from a running system with no issues. It's been slowly dying back over the last 2 months. No results from 'dosing' large amounts of live skimmate from several large tanks either. Repeated the above with a small (maybe 500g?) amount of live sand from a different, huge, established system. It died off also. I used an oversize UV and extra skimming - "the clean method"
That's what worked for me. BUT I also infused thousands of pods into the system. I did run dark except for my 'sump' lit 24/7 with trap material. After 5 days or so the floss wasn't catching much. Dinos returned within 2 days, and now do not seem to respond to lights out at all. So this is curious. Is your sump lit to grow life? Why do you think they don't respond to lights out? It's great that you're trying this stuff out!!! we need more empirical data. For transfusions, I think the ratio (% new) is important. It's like a war and the good guys lost because they didn't have enough soldiers. It may also need to be repeated several times. Depending on the size of the donor, the water transfusion can be done weekly and at very high % to upset the existing dino-favored balance. Maybe do it at night when they're mostly free floating? Here's what I'm basing this on. Put a dino covered rock in a healthy tank and they melt away. Either a lack of critical mass or a lack of biodiversity are likely their killers. Based on your results, I'd say getting dinos due to a lack of biodiversity doesn't mean that adding their competition is enough. Basically, they took over due to lack of competition, but once entrenched, they are now defending and the good guys need an edge to break in. 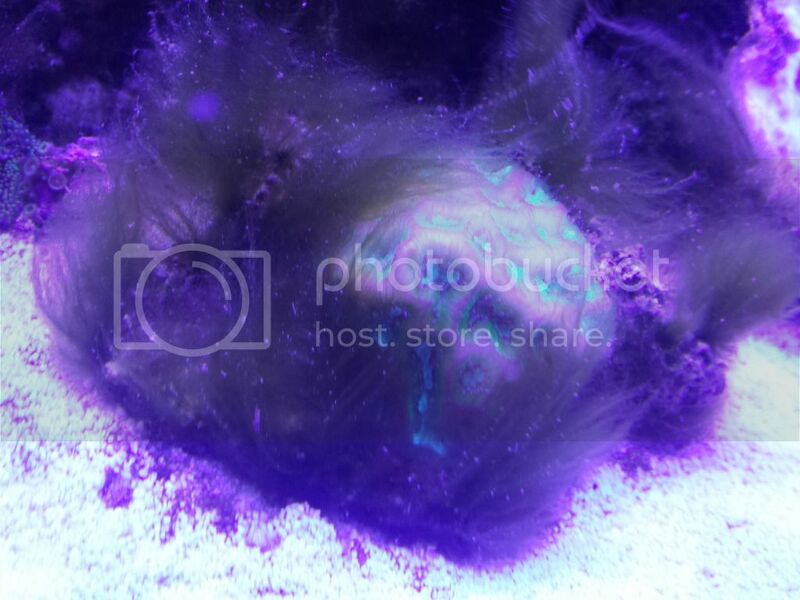 This mirrors other comments where a rock covered in green algae died in a dino tank.. Or chaeto melting away. Once they're in, the dinos make conditions favorable to them. Like an alien species exaforming a planet. That's why I think my UV+lights out+heavy skimming worked with the addition of new life in the forms of thousands of pods. It was all out war. I got thousands of copepods and amphipods and then hundreds of glass shrimp and peppermints. I put the shrimp in my chaeto/DSB refugium. They were pumping out new babies constantly. Yes but what kind of copepods were used to seed??? Probably tisbe species. They're benthic so will stay on rocks and sand. This company is ok for live food and maybe low end shrimp, but their shipping practices are very poor. They do respond and correct whatever fails, but it's time lost and wasted effort. I they sell those at lfs? Ya, but buy them from eBay or from a reefer on here, you get 4x the amount for half the price. For everyone who has dinos, do you run LEDs or t5s? Funny thing guys; as of this morning I am unable to find a single dino seed. I too samples from cheato, filter socks, scrapings from the wall, etc. I did have some funny spider web looking thing stuck to a birds nest colony, but no dino's in that either. New predator maybe? Was just browsing YouTube and found this vid. Even if they did eat them. Idk where to get them. They are either eating the dinos or being the host for them. What's everyone's opinion? I've seen some creatures who are eating dinos, and ones that appear to be in a symbiotic relationship with them. I believe they are all hitchhikers but our efforts to keep super clean water hurts their populations. Sachem stability is what worked for you? I have no way of being certain that stability was the magic bullet....but they began dying immediately after I dosed Stability.....I also started feeding heavily and kept the lights off for 36 hours. These little guys have been multiplying the reef, and they happen to be in seachem as well. Seachem Stability at 400x. Camera does not show it so well, but they appear very similar to the little guys from the filter sock. Last edited by seamonster124; 01/02/2016 at 05:22 PM. I think that the flatworm likely had symbionts or some organs showing in the pictures. I agree that we should see dinoflagellates being broken down if they were being consumed. That said, the flatworm could still outcompete the dinoflagellates for food. The foraminifer video was great! Thanks for the pointer! Compact fluorescents! (Lighting is highly unlikely to be a factor unless your spectrum is so severely off as to not support corals). First off, new people in the thread-my experience isn't typical. I seem to have an especially bad infestation. I have an all in one, so I don't have a true sump, just a couple of chambers behind the tank. I don't usually light it; I rigged a lamp for the tests. I would try UV but I can't for the life of me figure a way to rig a big enough unit in my aio. There's really no room back there. Re lights out: Dinos can switch from photosynthesis to predatory behaviour. I either pushed them towards mixotrophy or killed off the non photosynthetic strains, due to extreme selection pressure of multiple lights out periods. I had 2 genera of dinos, the 2nd, some kind of Prorocentrum? hasn't shown up lately. I agree about severe cases of dinos making the environment so hostile extreme measures are necessary. I did do one 90% water change with 'good' water. It caused a massive dino bloom. I added skimmate 3 times a week for a month. The new rock was close to 50% of the total rock in the tank. Chaeto from various sources invariably dies off too, but that may be due to not being able to maintain phosphate. I was trying to inoculate microcritters. I'm currently keeping nitrate at 15 (due to missing a decimal point, never try to calculate anything at 2am), phosphate still undetectable. Green algae is NOT coming back, pods are still absent despite adding multiple batches/species and I'm losing/lost all my Euphyllia. My montis are bleaching out and I didn't see my rock anemone today. I think I may be at a point where I'm going to have to nuke everything with Dino X and start over. I'd really rather not, but my corals are starting to be affected. Guys, I'm starting to think the algae issue in my tank is Dino. Although I can't be for sure as I've never diagnosed it myself. Could someone please help me? I would say as of now 35-40% of my tank is starting to be over run. I made a dent a few months back but I just can't win. Maybe just a proper algae ID and then I can find the proper remedy. I'm not advocating a 'new saltwater' water change. I'm considering a 'good tank export' water change. You don't want clean water, you want someone else's dirty water. Right, I did the 90 change with water from a 300 gallon SPS dominant tank that had been up for years. Skimmate from several running tanks also.